While looking for something else in my overstuffed files, this old postcard fell out from between two folders, and immediately, I thought about the story it contained. Albert Clifford Barney was from Cincinnati, the heir to a large industrial fortune. 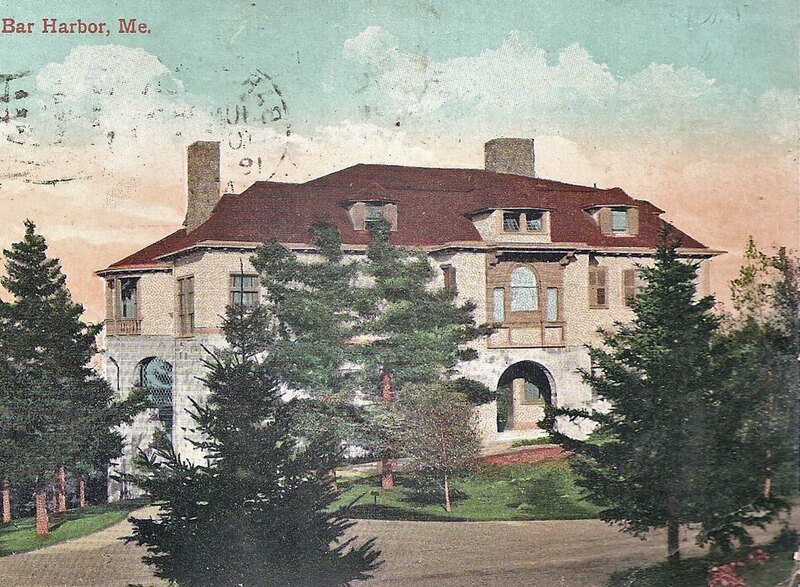 In the late 19th century, he and his artistic wife Alice--who before Mr. Barney had been engaged to the explorer Sir Henry Morton Stanley--- and their daughters Natalie and Laura arrived in Bar Harbor to occupy Ban-y-Bryn, their newly built cottage on a craggy hill overlooking Eden Street and Frenchman's Bay. Designed by Sidney Stratton, Ban-y-Bryn was a somewhat unconventional house, of indefinable style, considered 'modern' in style by one writer, but compared to a medieval castle by another. Built on the edge of a steep bluff, with mountains on one side, and the ocean spread out below on the other, the house had 27 rooms on four floors---including a top floor studio for Mrs. Barney, major rooms fitted with exotic and expensive woods, and kitchen and services on the ground floor..
Rich and charming, the Barneys were an immediate social hit in Bar Harbor, and for the next two decades, the society columns, local and international, covered the Barney's summer entertainments. Many of these parties took the form of short plays and tableaux vivants, and were often written by the Barney's elder daughter, Natalie, who was soon destined for greater fame as Rene de Goncourt's famed Amazon, and, but for Gertrude Stein, the most famous American Lesbian writer/saloniste in Paris---a surprisingly large demographic in the early 20th century. Unlike Stein, Barney was young and beautiful, and scandal and excitement attached her every move. But, I am ahead of my story. Already artistically inclined, Alice Barney's ambitions went beyond the usual High Society yearnings. 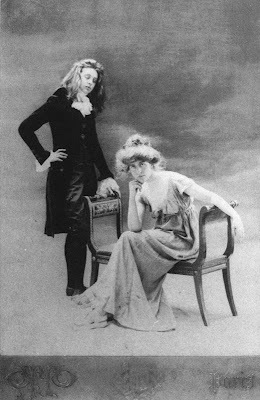 A chance encounter with Oscar Wilde, on his American lecture tour, at a New Jersey beach (no, you did not misread that sentence: Oscar Wilde. New Jersey. Beach.) gave Mrs. Barney encouragement to devote her life to art. The Barneys moved to Washington, not exactly a bohemian enclave, where Mrs. Barney created her famous studio house, as she pursued a career as a painter. Poor Mr. Barney, a conventional, clubbable sort of chap, was soon left behind in the melee, as wife and daughters each pursued a different Eastern religion, dabbled in various other exotic pursuits, and generally enjoyed their privileged, self-consciously bohemian lives. Not the typical late Victorian debutante, young Natalie's every move attracted endless attention in even in the relatively casual environs of Bar Harbor. Scandalously, she rode horseback western style, rather than sidesaddle, and caused furor for the dashing speeds at which she drove her carriage.. One of her tableaux vivants was a play based on the Queen of Hearts from Alice in Wonderland, produced,with her family and friends as the cast, as a fundraiser for the local hospital, The Barney's next door neighbor Walter Damrosch, conductor of the New York Philharmonic, played the Queen, whilst Natalie, in a glimpse of things to come, played the King. And how did the Barneys arrive each summer in Bar Harbor? They would board the Bar Harbor Express, a crack train of the New York Central, originating in Washington, which communicated between several major cities and the fashionable summer resorts. After a pass through Ellsworth Maine, the train made its final stop a little further Down East at Hancock Point, where passengers would disembark and board a steamer that would glide them across the waters of Frenchman's Bay to Bar Harbor. And the name of this steamer, that each season took the Barney daughters to their summer playground? The Sappho. 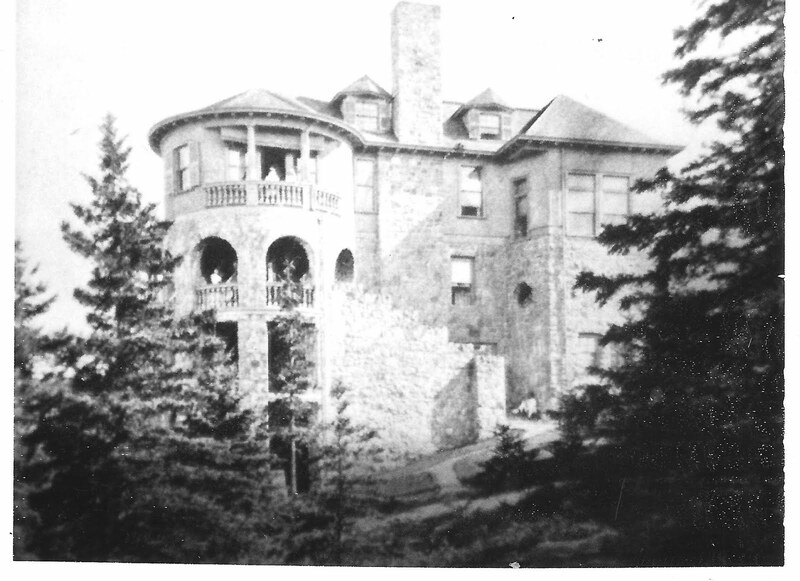 As for Ban-y-Bryn, it was one of the seventy large cottage that burned in the Bar Harbor Fire of 1947. Dear DED: Thank you for an interesting post. I had never heard of this woman. There is a fascinating book: "Music's Modern Muse", by Sylvia Kahan - a biography of Winnerette Singer Polignac. Princesse (if you please) Polignac was an heir to the sewing machine fortune and lived in Paris all of her adult life, where she had a brilliant salon. She supported and presented concerts by Stravinsky, de Falla, Poulenc, Rubenstein and many others. She also had some involvement with Ms Barney as they were both lesbians. If you have the opportunity, take a look at the book - it is a recent publication. I can't imagine Oscar Wilde at the Beach.....or New Jersey. Sensitive aesthetes. Thank goodness - they keep us on our toes. Thank you for this post on an interesting subject. jaw-dropping. Had no idea about Miss Barney's girlhood, or that Walter Damrosch played the Queen to her King. We in the 21st century tend to view the past as a dry and lifeless diorama of stuffed figures until learning what things were really like back in the day. I have always seen her first name written as Natalie. 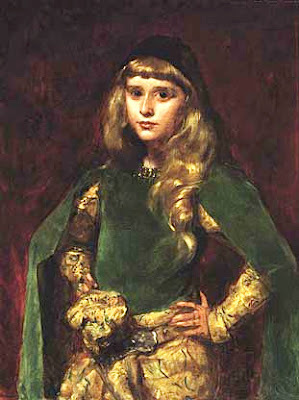 I first came across her in a book on the history of the arts in Paris. oh come on dilletante - this is just too many coincidences in one place - the Sappho - oh, please. one of my favorite houses esp. the side view with the stone tower. did this one go in the fire or torn down? and i hope this is installment 1.
can you refer me to a good pic of the rockefeller house as the only one i ever saw is so-so? Oh my...someone has to do this... may as well be me....not into censorship, sorry. There's a great biography of Natalie Barney by Suzanne Rodriguez, WILD HEART- A Life Natalie Clifford Barney & The Decadence of Literary Paris. It came out in 2002. Lots in there about her summers in Bar Harbor growing up & "sapphic" goings on, particularly with Eva (Evalina) Palmer. My family purchased the Barney Property after the 1947 fire and built a home from the stone remains of the garage and enjoyed the spectacular view of Frenchman's Bay. I have a group picture of the Barney's taken at Ban-y-Bryn and it shows a young female hiding behind an adult female appearing to be very camera shy. Is there someone I can e-mail the picture to? To me! Please post the photo to me. I am translator, with Sally Hamilton of Cincinatti, of the charming comic novel about Natalie Barney written in 2001 by Francesco Rapazzini, "Un soir chez l"Amazone" which is titled "A Night at the Amazon's" in English. I am also editor of "Romaine Brooks: A Life" by Cassandra Langer, and it was my great pleasure to helpa rrange the lecture by Sylvia Kahan on Winaretta Singer at the Ormaine Brooks exhibition at the Smithsonian last summer.